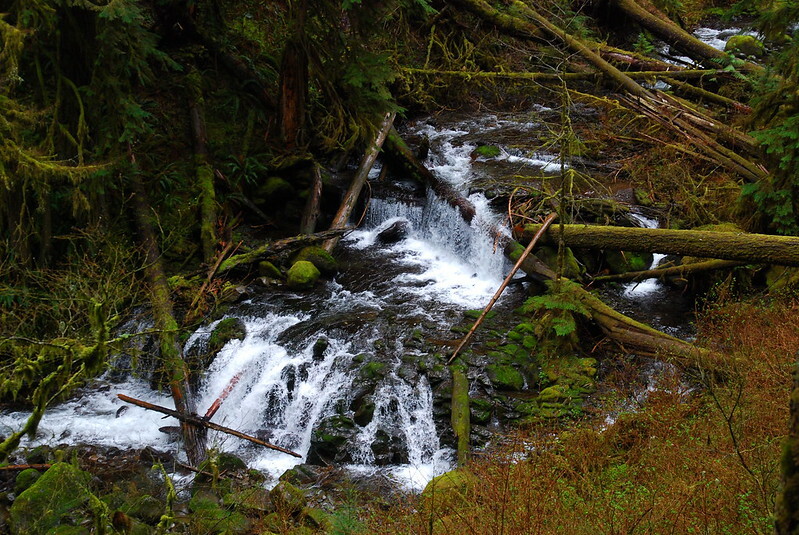 Adventure #29: Multnomah – Wahkeena Loop – Hi, Alpine. I’ve been thinking for a while about doing a series of posts about hikes in the Gorge that everyone’s already done: Angel’s Rest, Eagle Creek, Beacon Rock, Hamilton Mountain, Dog Mountain, this one… The idea is that there’s a special sort of dissonance on popular trails, because they’re popular for a reason – that is, they’re unbelievably beautiful – but, at the same time, that popularity leads to them being unbelievably un-wilderness-y. And so hiking them is this funny mix of the best and worst things in the world – hundred foot waterfalls and hundreds of candy wrappers. They make me sad, but at the same time I love them so so much. And more than that, they probably mean more to me than a lot of the more remote trails, because they were the ones I saw first – what got me here. Maybe I’ll still write those posts some day, but every time I’ve tried so far I just couldn’t do them justice. It all seems too profound, too big, too much, or maybe just too obvious for me to capture. 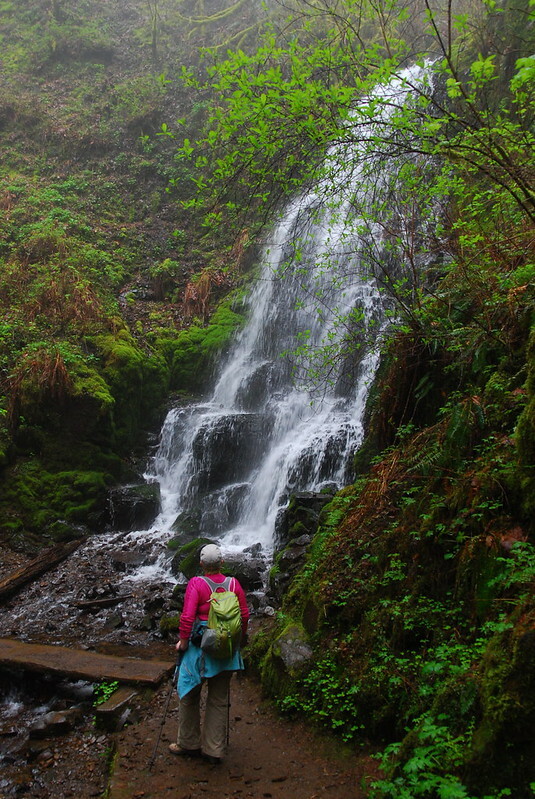 And so here’s this instead, a trip report about a trip you’ve probably already taken: a loop up Wahkeena and down Multnomah, maybe six miles, with maybe twice that many waterfalls, most of which would be the highlight of any other hike. It’s supposed to rain. Not the sort of uncertain drizzle that’s always happening in Portland: it’s supposed to rain with uncharacteristic self-assurance. But when we pull into the Multnomah Falls parking lot / truck stop / theme park / family counseling center, it’s miraculously clear. On the way to the lodge, a kid walks by eating an ice cream. Half of it’s on his face. Families pose in shorts on the pavement in front of the lodge. The waterfall viewing platform is standing room only. The bathroom lines are like Disneyland. I only take one picture – from the parking lot. It’s my favorite picture of the day. 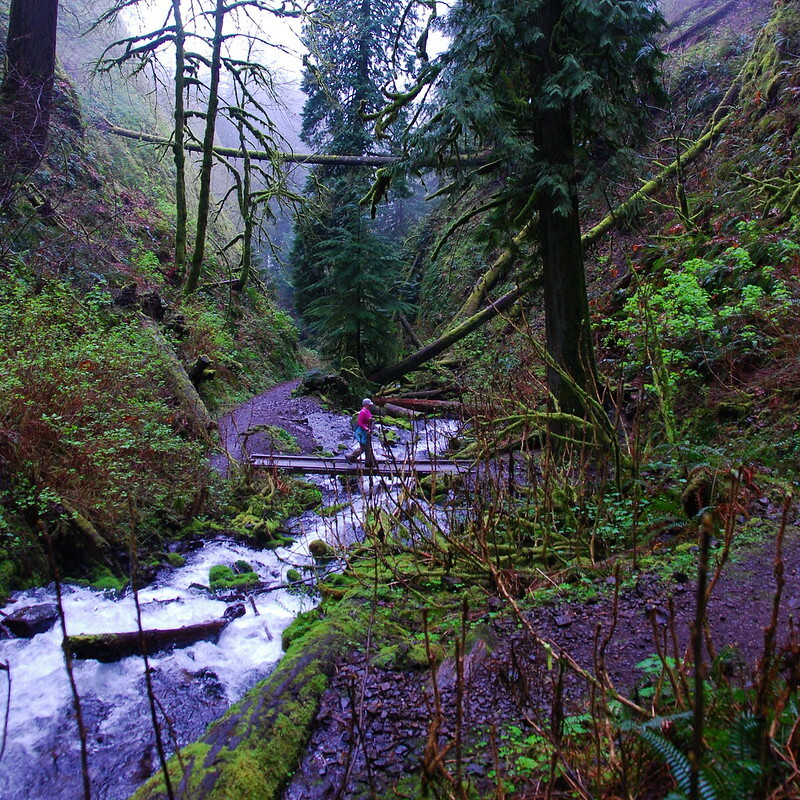 The connector trail between Multnomah and Wahkeena Falls has been closed for a while. They were building a new landing at Wahkeena Falls or something. More pavement. 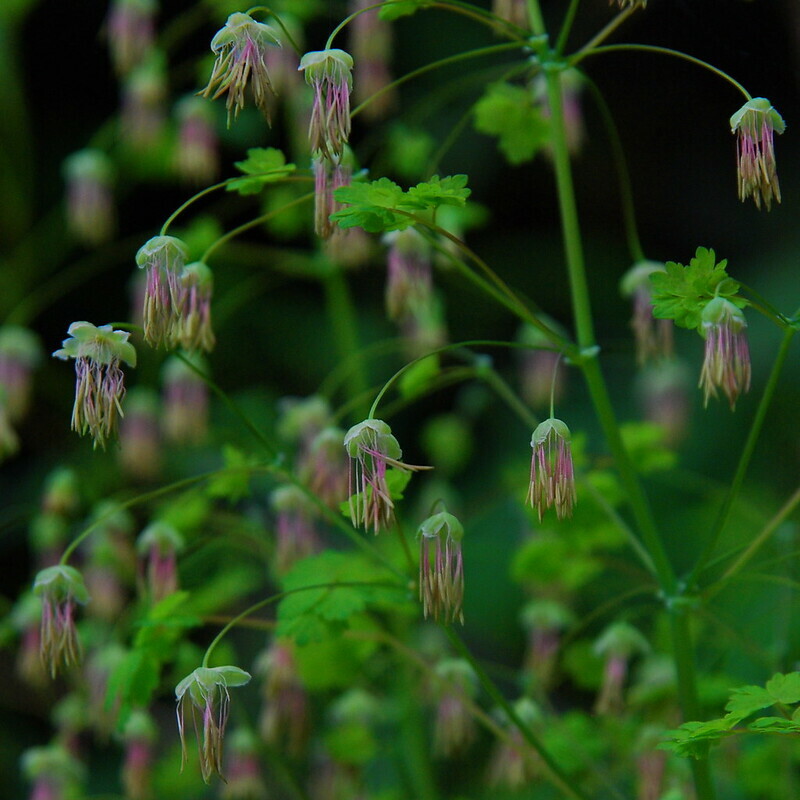 But the trail’s open now, and all these flowers I don’t recognize are starting to bloom. Krista’s got names for all of them, descriptive ones in plain English different from the ones I’ll later read online. As usual, I prefer hers. This is, she tells me, Chinese Lantern. The lot at Wahkeena Falls is full too, and cars – big cars, mostly, with bumper stickers celebrating sports teams and suburban restaurant chains – are parked for a quarter mile down the shoulder of the Old Gorge Highway. When they first built the old highway – when it was still the new highway – it was envisioned as a scenic byway, a destination in itself. People were supposed to take a whole day, drive slowly down the curvy road. A decade later that didn’t suit anyone anymore, and they built what is now Interstate 84 parallel to, and sometimes on top of, the old road. Now people take the freeway to the remnants of the old road, then exit briefly for a scenic few miles along the best bits. The new construction around Wahkeena is sleek and modern, exactly like a parking lot and exactly unlike nature. We walk up the paved trail to the beautiful old bridge, then up through protruding tree roots to where the pavement ends and the real trail begins. 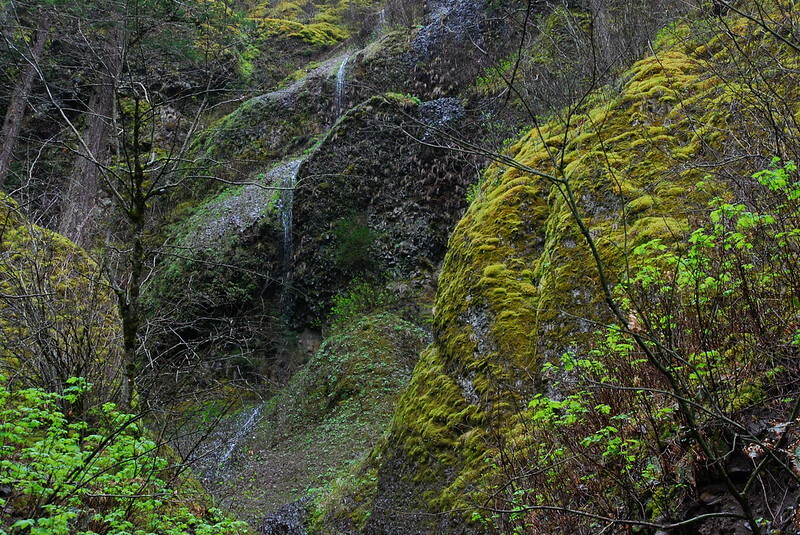 I only take one picture: not of Wahkeena Falls itself, but of a seasonal stream just west, cascading down a basalt amphitheater. As soon as we leave the pavement I feel better. 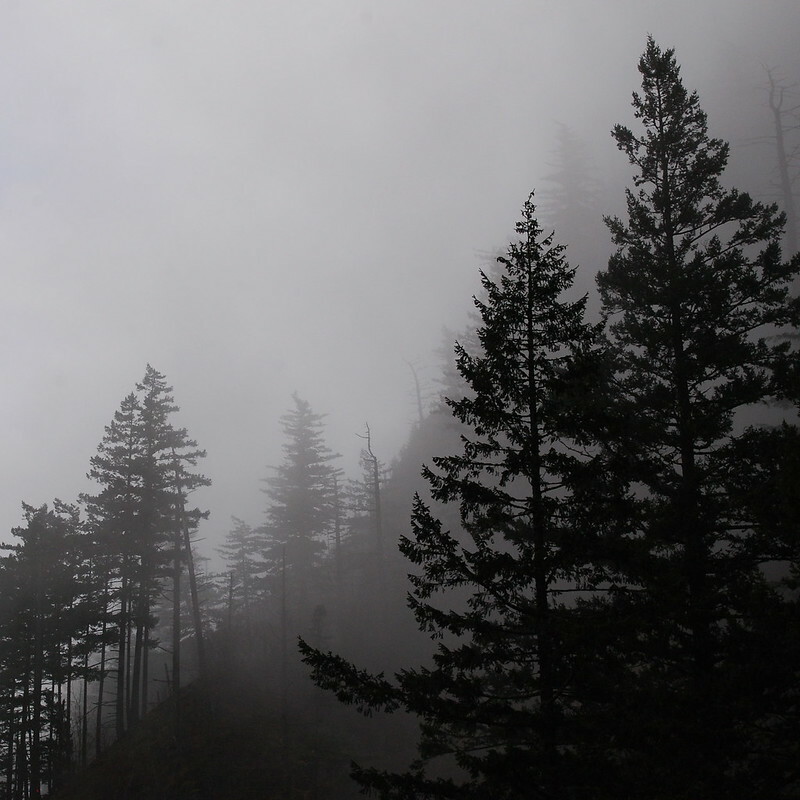 The trail’s not steep, exactly, but it gains enough elevation in the first half a mile that we’re now in the clouds, which are moving into the tall trees above us, making everything look like a movie. Maybe my favorite bridge in the Gorge is just a few hundred feet passed the end of the pavement, crossing Wahkeena Creek just as it emerges from a narrow canyon. The first time I saw it a few years ago I was going the other way, and didn’t know how close I was to the parking lot. So I stopped there for a long break, eating a banana with my feet in the water, feeling as though I was still in the wild. I still feel like that when I see it. And then there’s Fairy Falls. My whining aside, I really love this place. 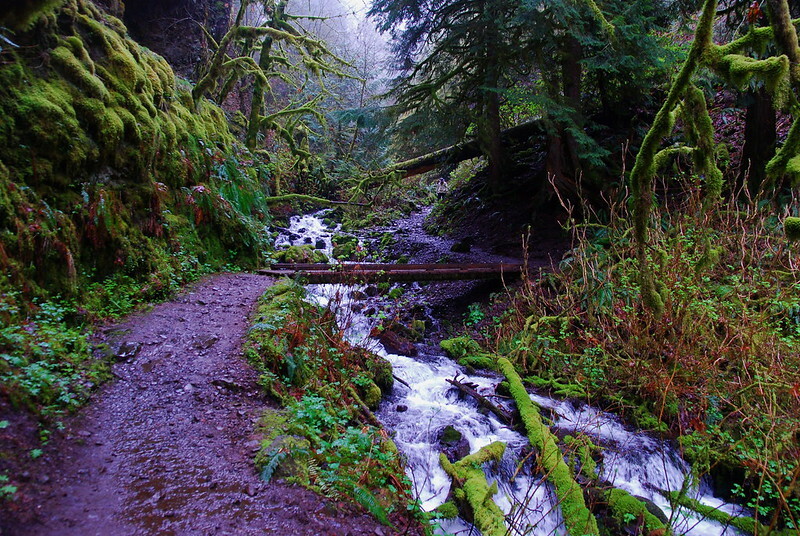 The walk up through the forest from Wahkeena to the Larch Mountain Trail is pretty and uneventful. It starts to rain, a couple trail runners pass, the devil’s club’s early this year. I think about how remarkable this is – just a thousand feet above the parking lot bedlam – to be on trail that’s more-or-less all our own, looking across the river at Washington’s hills, the trees below hiding two highways. The first time I came here, it was an afternoon lark. 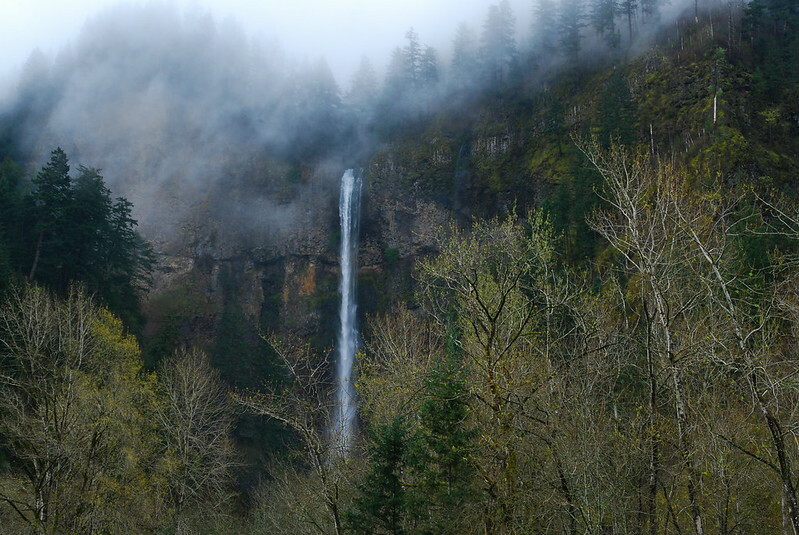 I’d just finished grading for the term, and remembered vaguely that there was a trail above Multnomah Falls. I walked up without a map, unsure of what to do when the pavement ended. There was an ice-covered washout on the Larch Mountain Trail, on a slick slope leading down to the creek. I tried to walk across, but fell halfway through, and slid all the way down to the water. I crawled back up the hillside, laughing at myself, and kept walking. But I didn’t want to go back the same way. Sorry: I really didn’t want to go back the same way. Someone had posted a map of the area on a tree, in a frame better suited for a fireplace mantle. Looking carefully at the faded paper, I saw the Wahkeena Trail, and figured it was worth a try. The next week, I walked up Larch Mountain for the first time, a new map in my bag. I’ve still got that map, but it’s wrinkled now, from being folded and unfolded so many times. And it’s starting to smear from all the times I’ve traced routes with wet fingers in the rain. As we’re turning the corner, there’s a couple with a dog and a young kid, all in new rain gear. The dog too. The dad asks if the trail goes to Wahkeena, and I tell him, in typically excruciating detail, that it does. I have a map if he wants to see. Two, actually. The framed map’s not really readable anymore. He smiles, thanks me, and they pass, slipping slightly in the mud. They’re the only ones we see until we’re back on the Multnomah pavement.